The final part of the war in Europe during WWII was the Allies getting ready to head to Germany, itself. The D-Day landing had been successful. Paris had been liberated. Now it was time to head to Berlin. It wasn't going to be an easy trek, of course, as the Germans were falling back on their supply lines. There would be counter-offenses, of course, and the war was far from a sure-win. 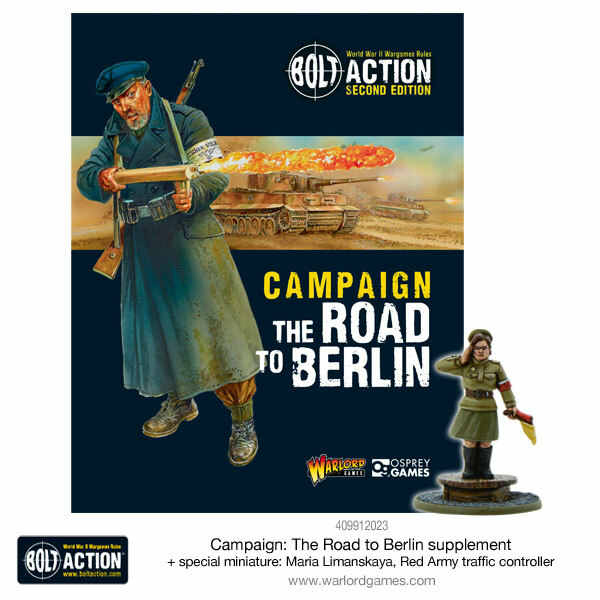 Soon, you'll be able to bring that action to your Bolt Action tabletops with the Road to Berlin campaign, available for pre-order now. Diving through the Eastern front, you’ll be able to learn about the very bloody and arduous operations endured by both the German and the Soviet forces endured..
June 1944 - the Axis powers in Europe are about to be subjected to two major hammer-blows. In the West, the final preparations were being made for Operation Overlord, the Allied invasion of Western Europe. In the East, the Red Army was planning a massive offensive, with bold objectives set to critically damage the German Army and eject it entirely from Soviet soil. For the Germans, a sense of fatalism began to grow, whilst amongst the Soviets, spirits rose. After months of crushing defeats, encirclements and mass capitulations, the Germans were finally revealed to be beatable and their aura of invincibility had finally been ripped aside. 'The Road to Berlin' contains a wealth of new units, characters, Theatre Selectors, and new scenarios specifically geared for Bolt Action players old-and-new to re-create the final battles of the Third Reich as the Allied forces beat them back to Berlin. Not only that - but as with the majority of our publications, if you order 'The Road to Berlin' direct through the Warlord webstore, you'll receive an exclusive miniature, not available elsewhere! For 'The Road to Berlin' - we opted for the iconic Maria Limanskaya - having once worked as a traffic director, she quickly became an icon of the Allied victory over the Axis powers.